M-commerce (a.k.a. mobile commerce) is rapidly overtaking eCommerce as the de facto mode for online transactions. With over 50% of total online orders coming from mobile, there is little doubt that by the end of 2015 transactions from mobile devices will far eclipse those from desktops. Myntra, the leading fashion retailer in India, has already announced its plans to become a mobile-only marketplace by the end of the year. Snapdeal declared that 65% of their orders come from mobile and by the end of the year, they expect the proportion to be in the whereabouts of 90%. With such mind-boggling percentages in favor of mobile, e-commerce merchants are left with no choice but to embrace mobile. 1 Why is this happening? 2 What does “Adopting Mobile” mean? India is a mobile-first country. It does not have the infrastructure to serve a billion laptops, but it is well on its way to serving data on one billion mobile phones. Mobile is the only connected device for many consumers in Tier 2 & Tier 3 cities, as well as rural regions. With Android taking over India, even the low-income bracket is able to afford a smartphone, which is then used as an internet device. According to IAMAI, 65% of internet users are e-commerce customers. Big brands are not present in Tier 2 & 3 cities. So the only way aspiring youngsters can buy their favorite brands of jeans and t-shirts is online. 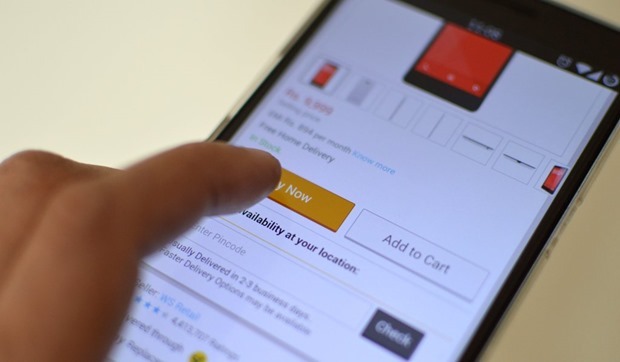 Cash-on-delivery has opened up a whole new market for e-commerce in India. Credit cards are highly uncommon in India, but with cash-on-delivery, the rural population is also able to purchase online. For these reasons, there is little surprise that India is one of the largest mobile commerce markets in the world (second only to China). Smaller merchants are following in the footsteps of giants such as Snapdeal, Flipkart and Myntra and adopting mobile in a big way. What does “Adopting Mobile” mean? Adopting mobile means to be able to serve mobile shoppers well. Mobile shoppers are very demanding and impatient. 57% users won’t recommend and 40% users will turn to a competitor if they have a bad shopping experience on mobile. They will not wait more than 4 seconds for a page to load, and the conversion rate goes down by 7% for every second delay in page load time. What these statistics mean, is that mobile shoppers are very hard to please – and the efforts made to please them constitute “adopting mobile”. Here are a few ways in which merchants can adopt mobile. Web visitors are increasingly sensitive to page load times. They tend to care more about speed than all the bells and whistles we want to add to our web pages. A bad experience with speed can have a persistent effect on customer behavior. The main driver behind the rise of mobile shopping has been the customer – not online stores. Customers expect everything to be mobile-ready, and it reflects badly on brands if they haven’’t already made this step. It can be enough of a motive to push customers elsewhere. Online retailers can provide a better experience to its customers and, thus, trigger higher conversion rates. A well-built mobile app targeted towards the right audience can achieve outstanding levels of engagement. Mobile opens up new possibilities for engagement that were once closed to merchants. Analyzing customer activity on the app, retailers can send targeted push notifications, in-app notifications and email with product recommendations. A well targeted mobile marketing campaign can lead to unprecedented amount of user engagement that was thought impossible before. Online merchants are well aware of the “go mobile or go home” e-commerce landscape, particularly in India. However they struggle to understand what adopting mobile means. It means a lot more than a responsive site. It means doing everything it takes to acquire, engage and retain mobile customers. Or they might as well kiss these customers goodbye. Mobile eCommerce is simply a broad accpetance ever in terms of browsing-to-shopping ratio. Multitudes of buyers are just expected. Demography is at the edge of expansion and so does an eCommerce growth. Cash-on-delivery, a perfect strategy too. An enhanced UX is indeed a sign of such compact digital shift!! !